UK restarts frigate competition - but will anyone take part? LONDON - Britain’s Ministry of Defence is restarting its contest to build five general purpose frigates for the Royal Navy after it terminated the original competition due to insufficient interest from industry. The Defence Equipment & Support organisation, the MoD’s procurement arm, has issued a “prior information notice” informing potential bidders it is moving forward with the Type 31e program, and plans a short period of market engagement with companies or consortia that have expressed interest starting on Aug 20. “We have relaunched discussions with industry for our new Type 31e fleet, and this week issued a Prior Information Notice to ensure we do not lose any momentum. We remain committed to a cutting-edge Royal Navy fleet of at least 19 frigates and destroyers, and the first batch of five new Type 31e ships will bolster our modern Navy,” said an MoD spokesperson. “The purpose of the market engagement is for the Authority [DE&S] to share key elements of the new procurement, including technical and commercial elements. The Authority intends to use the feedback from the market engagement to inform the further shaping of its requirements and commercial construct,” said the DE&S in its announcement it was relaunching the competition. The Type 31e is a key part of the government’s 2017 national shipbuilding strategy which in part seeks to open up the sector to local competition, rather than contract via a non-competitive single source contract with U.K. giant BAE Systems, the world’s third largest defense company according to the Defense News Top 100 list. The fast track schedule for the Type 31e calls for the initial vessel to be in service by 2023, replacing the first of 13 Type 23 class frigates due to be retired by the Royal Navy in the period up to the middle of the 2030’s. The final Type 31e -- the e stands for export -- is due to be delivered in 2028. Eight of the Type 23’s will be replaced by anti-submarine warfare Type 26’s. 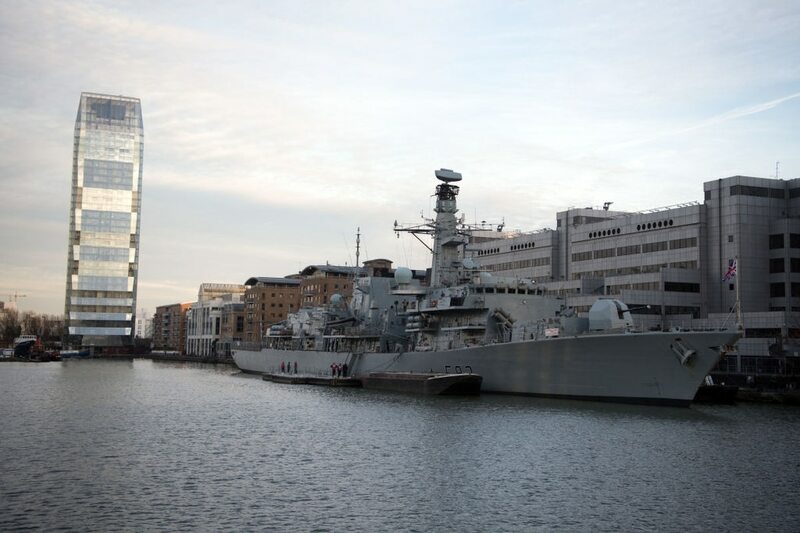 The remainder of the Type 23’s will be replaced by the Type 31e. DE&S and industry are up against a time crunch on getting the first Type 31e into service, one which some executives here see as daunting, if not unachieveable, thanks to the need to restart the competition. But despite the delay in getting to the competitive design phase contract announcements, DE&S says it remains committed to the 2023 service date. “A new streamlined procedure will present an opportunity to save time in the overall program. We will release more information about our plans when we have completed the market engagement - which we plan to start from Aug 20,” said a second MoD spokesperson. The Type 31e is planned to carry out maritime security, interdiction and other tasks, releasing more complex warships to their primary roles. Originally the British were planning to build 13 Type 26’s and use five of the warships in the general purpose role. The scheme was junked in the 2015 defence and security strategy review on cost grounds, and a decision taken to build five of the lighter, bargain basement Type 31e’s alongside the Type 26’s. The first of the Type 26’s is under construction by BAE at its Glasgow, Scotland, warship building yards. BAE is under contract to build three Type26’s and all eight warships are scheduled to be built by the company, with the first one handed over by the contractor in 2025. The program received a major shot in the arm recently when Australia selected BAE and the Type 26 for a huge anti-submarine warfare frigate requirement. Assuming the deal is signed, the warships will all be built in Australia. Who's building and contributing what for Australia's Future Frigate, and what technology is involved in the Type 26 design? It’s the same type of deal for the Type 31e and the Royal Navy. The stipulation is that all the warships have to be built in Britain using a design which offers export opportunities for industry here. The Conservative Government has made vague promises about building further frigates for service in the 2030s to bolster its meager surface warship fleet, but until funding is committed that remains just talk. In February, Britain launched the competition to find a contractor interested in building five frigates, at a total cost of no more than £1.25 billion. But the process had to be abandoned in late July when the DE&S said it had failed to attract sufficient compliant bids. DE&S originally said it was looking for up to four bidders to award six month competitive design phase contracts, ahead of placing a design and build contract by the end of the first quarter next year. The MoD hasn’t said how many compliant bids it received, but it is likely only offers from a consortium led by Babcock and a Cammell Laird led partnership with BAE Systems in the running. The Babcock-led team, which also included naval designers, sensor suppliers and other shipbuilder,s were offering the Arrowhead 140, a modified version of the Danish Navy’s Iver Huitfeld-class warship designed by OMT. The opposition Cammell Laird-led team was offering a smaller frigate design known as the Leander. At the time of the original procurement termination, industry executives here said the requirement for so much of the work to be done in the UK had deterred some international companies who initially had shown interest. One executive said the exceptional degree of risk the MoD wanted industry to take on the program had also been a deterrent.